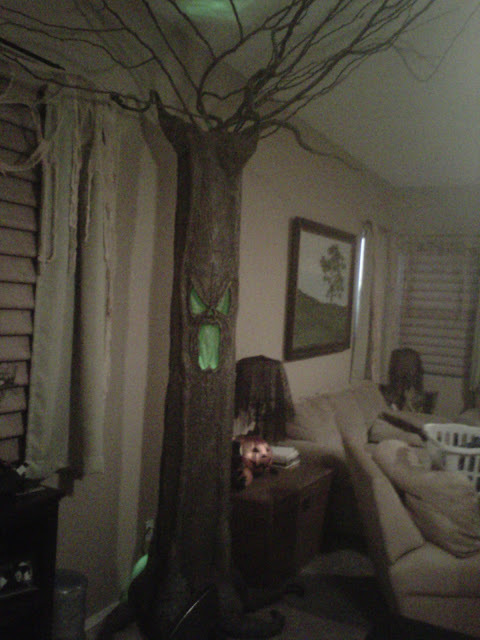 As I have mentioned before, I am doing a Haunted Forest/ Faerie Tale Witch Cottage theme in my kitchen this year. So I awoke one night and realized I must have a haunted tree dividing my kitchen from my living room! I became obsessed with the idea, and immediately started trying to figure out the best way to do this. First I decided I wanted it to be compact and capable of being broken down in two parts for storage. It also needed to be tall (my ceilings are 10 ft) but incase I move to a shorter or taller house one day it needs to be adjustable. I also wanted the branches to sprawl across my ceiling. I had a lot to consider! 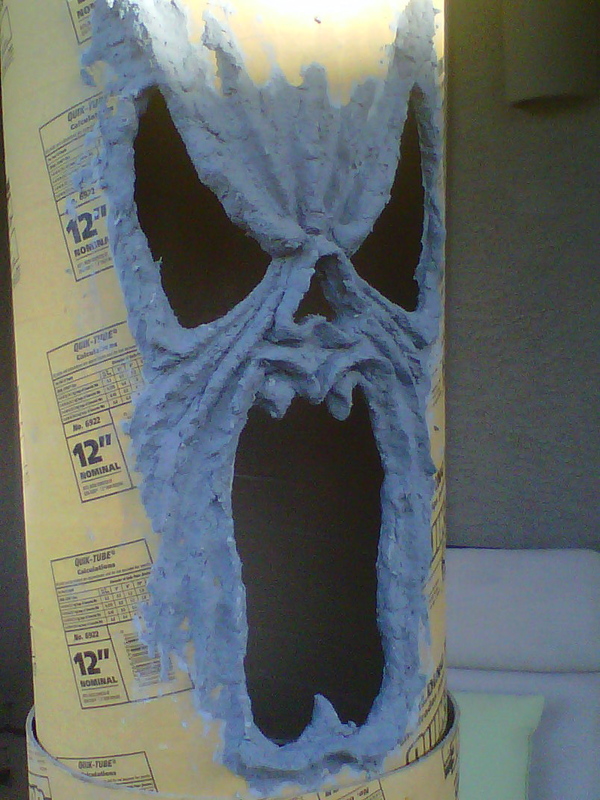 So I decided to use concrete pour molds for the base. They are around $10 each for the 12" size. The two I bought, one was actually a little bit smaller and fit snugly inside the other, perfect for what I had in mind! I thought about using chicken wire, but I really hate using the stuff and if I can avoid it I will. 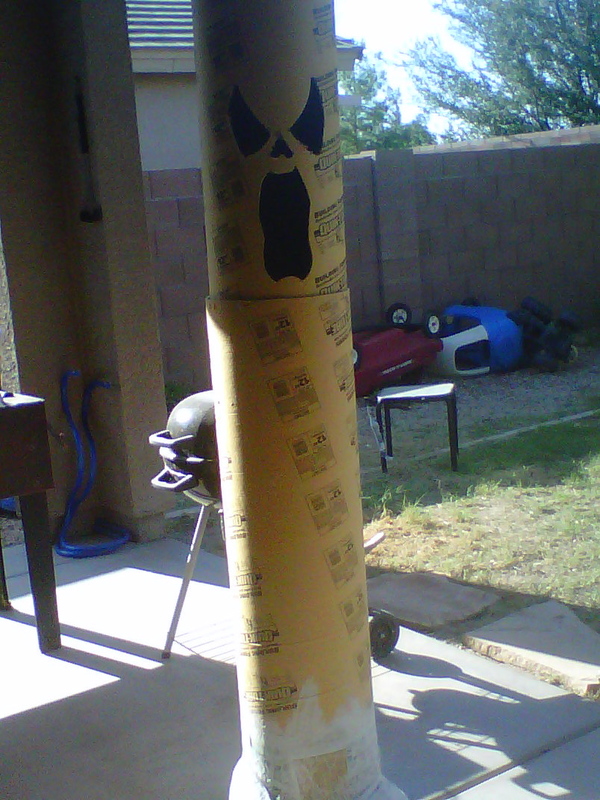 I found some flexible black irrigation pipe in our garage and decided to use it as a stopper for the top tube to rest on. I hot glued it just a little to hold it n place (about 6" from the top) then went over it in Gorilla Glue to really make it strong. PS. The bottle exploded and made a huge mess. I still have glue on me! I wanted a strong base since its so tall. 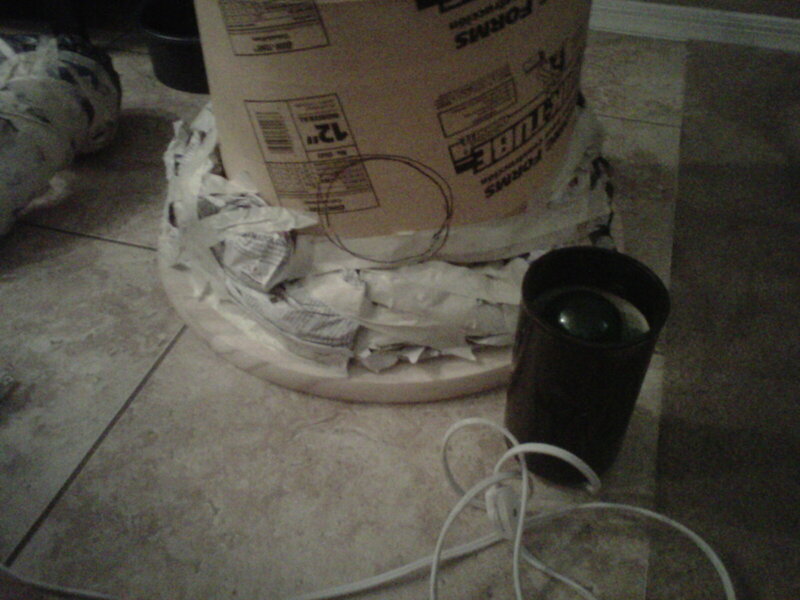 I forgot to get a cheap piece of plywood when I was at the store, but I was into the project by now and not wanting to run back out, I grabbed a round plywood circle I already had laying in the garage and gorilla glued it on the bottom. When all was dry, I crumbled up newspaper to taper it down. I also cut out a hole for my uplight to go in the back. For the roots I crumbled up balls of news paper in varying shapes using masking tape to secure them. 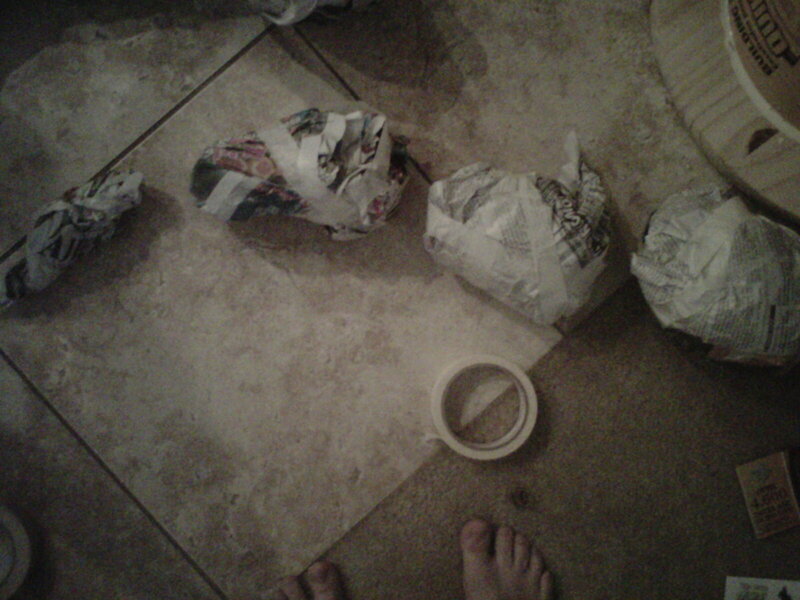 I coneccted them with more paper at the joints and more tape. 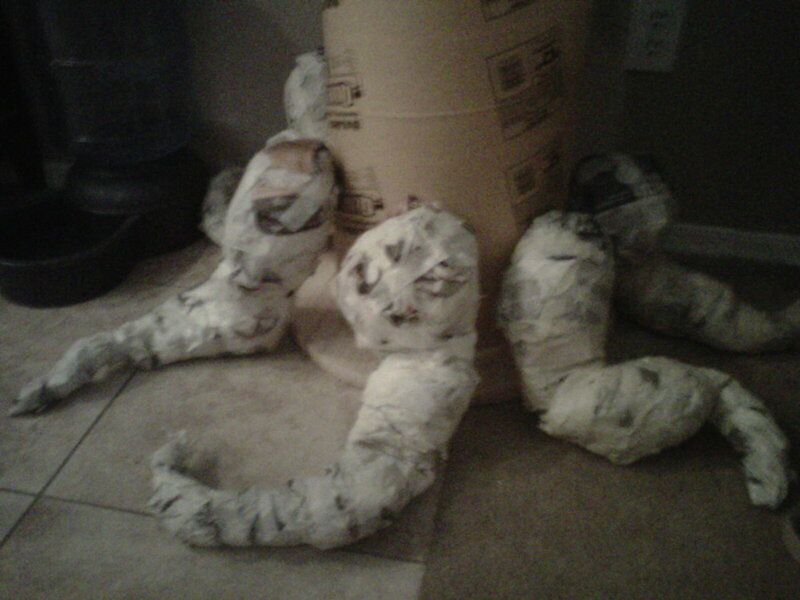 When I figured out the shapes I wanted the roots, I started filling in gaps with more crumpled paper and tape. 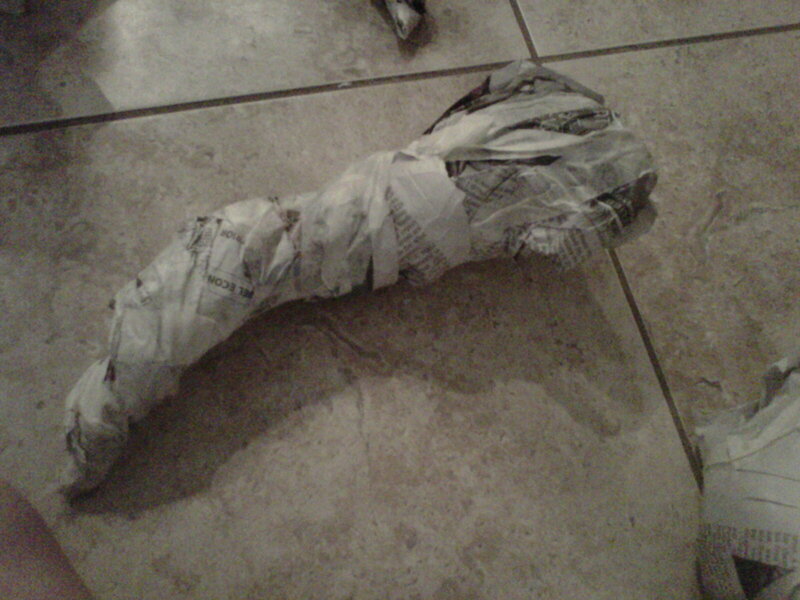 Then hen it all got several coats of paper mache and then several more until the base was super strong. On the top half I started the face. I just drew on a face and cut it out with a serrated knife. Here it is sitting in the bottom half. I tried to match the bottom ridges to the top as best I could. 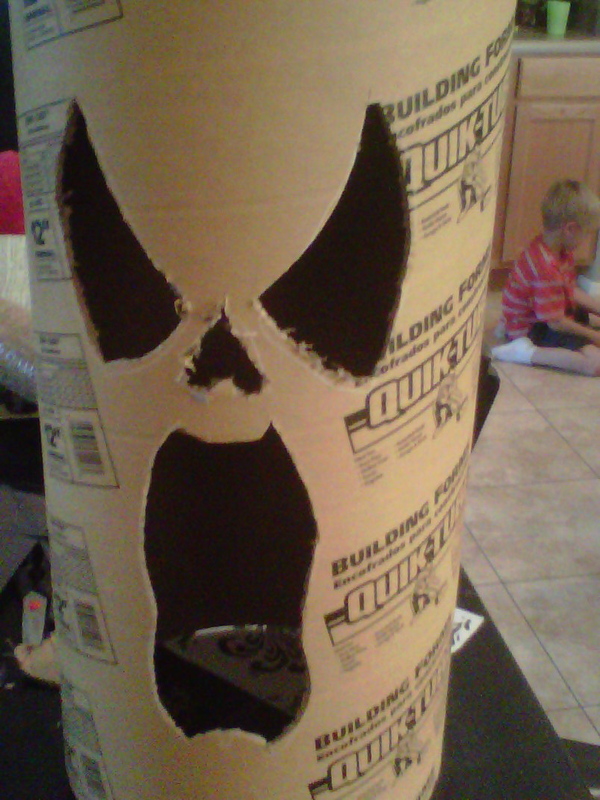 Also, I used tape as a guide on the top half to show me exactly where it met the bottom. 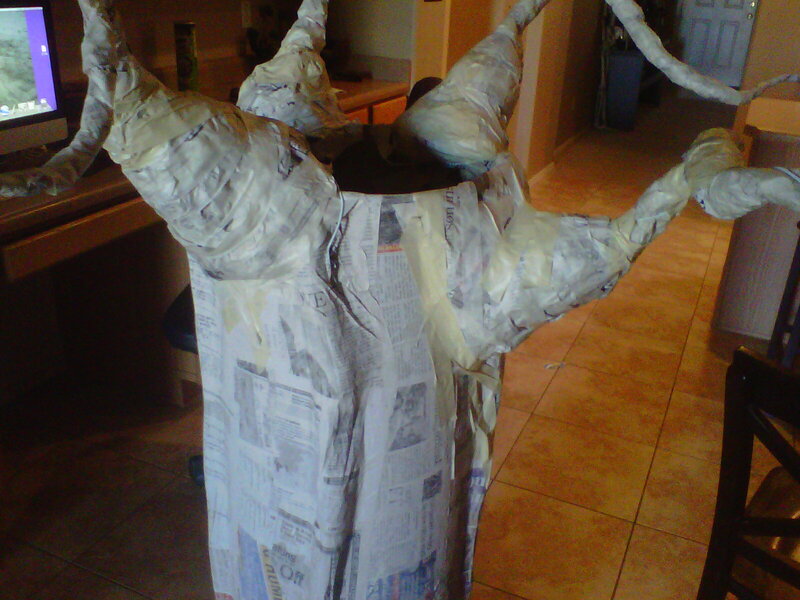 For the top branches I used coat hangers and taped them to the tree really good before buliding up and then paper maching over the whole thing. I wanted to make more branches but I really am behind schedule right now, so it got only a few for this year maybe I will add some next year..
For the bark I decided to use more celluclay because I have a bunch of it. I used a whole bag on this tree. I would just glob it on and then smooth it out a little in sections. 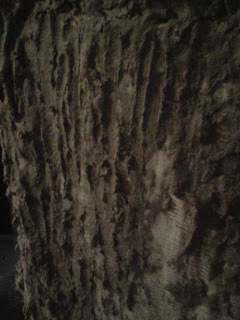 Then I would get my fingers a little wet and scrape it to make my bark texture, clumps and lumps are a good thing. 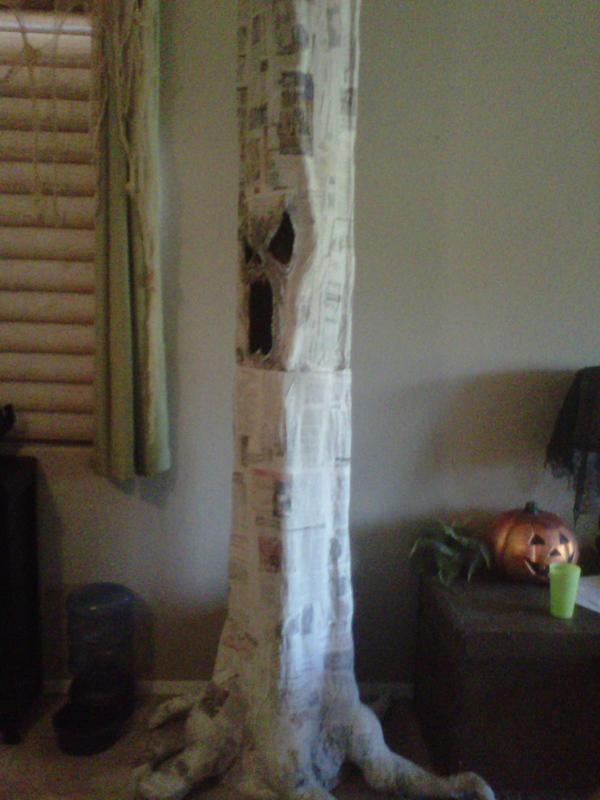 Here it is finally dry and ready for the paint. I used a base coat of a charcoal black color I had on hand called fittingly called 'black magic'. As I was going I would brush on and blend in (while it was still wet) a brown color in the highlight areas, just to give it a little more depth of color. Lastly I dry brushed on a lighter taupe color. No closeups of that...Hmm I need to take a good bark pic too and add it here. I decided for now to just use some tissue paper tacked behind the face diffuse the light a bit. For the top branches crawling across my ceiling, I can't make them permanent because like I said it needs to store and I don't want to be married to this height incase I move. 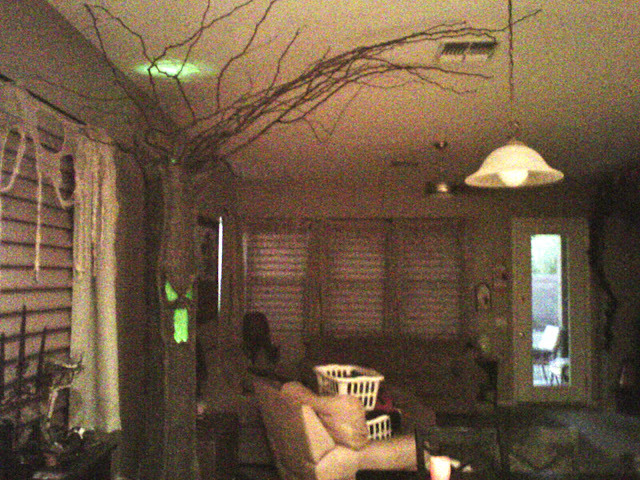 So I took some old branches I had saved from the last tree trimming, using eye hooks and fishing line I attached them to the ceiling with the bases just resting inside the top of my tree. Now they have the appearance that they are coming out of the tree but they are really just hanging from the ceiling over it. Also, this way I can add more branches and fan it out as far across my ceiling as I want. but for now I need to go put away that laundry in the picture. I will be adding pics soon of the finished tree and it's creepy hanging greenery. Also maybe a cleaner house in the next picture. Wow!!! So creative. I would keep this in my house all year long. I love it!!! 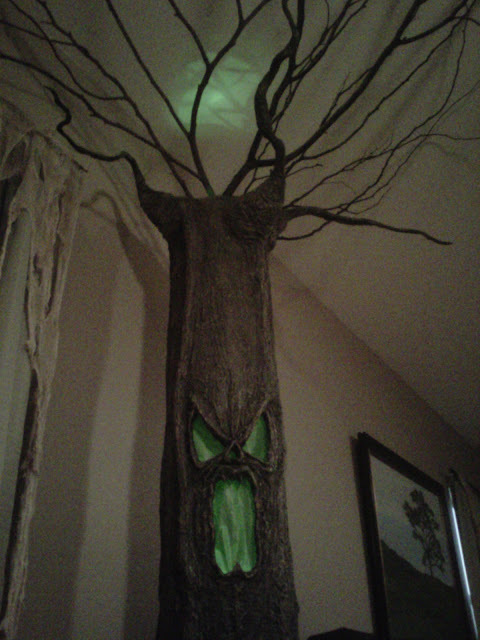 I never thought a haunted tree could be so awesome! That is totally something I would do. I like to go big on my decor! Your tree turned out absolutely awesome... great job! Wow, that is insane! Very cool. I am working on the finishing touches this week., and will add updated pictures as soon as I can. My house, garage, and yard are almost done with their transformations. I love this tree. I was just telling my wife last week..."Man I wish we had a tree in our yard." She agreed and we thought and we thought and we decided that in order for me to do it, I would have to do it in sections that could be brought out and assembled. Yours is so awesome. I wonder how I could modify this idea for next year so it could be put together in pieces. Amazing... I'm into Halloween and Horror movies too. Check out my blog and be a member! Great idea-absolutely love it! I hope to use it soon! I Haven't been on in a while. Thanks so much for all the compliments. I am still recovering. This was seriously the busiest Halloween ever! I'm finally almost done putting things away. Hopefully I'll have time for some new projects soon. If a tree screams in the middle of the forest, and there's no one there to hear it, does it really exist? Existentialism is vanity. no. way. in. hell. This is the best thing since sliced bread. No, scrap that. Since te invention of the wheel. I found this via pinterest and fell in love with this tree on a scale that is not even rivaled by the love I feel for pizza, strawberry ice cream and white wine. And kittens. And bats. Which is, let me assure you, a lot of love. I'm totally stealing this idea. I'm definitely making a few of these this year. I may start this week. Thank you for sharing this idea. I'll credit this right back to your blog, don't worry! <3 <3 <3 I thought to try making mini ones, with "paper towel cardboard rolls"???? Think it would be strong enough? Or any better ideas, tips, etc. would be welcomed! That would be great I think. The celuclay is pretty heavy when wet so I would go light at first and let it dry see how the cardboard holds up, then do more layers. 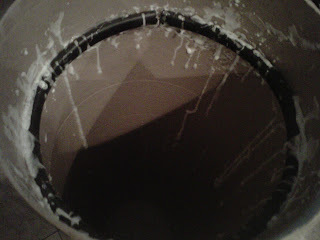 Also try and make the celuclay a pretty dry mix so it doesnt soak and warp. If you do it like above only a smaller scale and add the layers of paper mache before, that should re-eniforce your tubes enough. 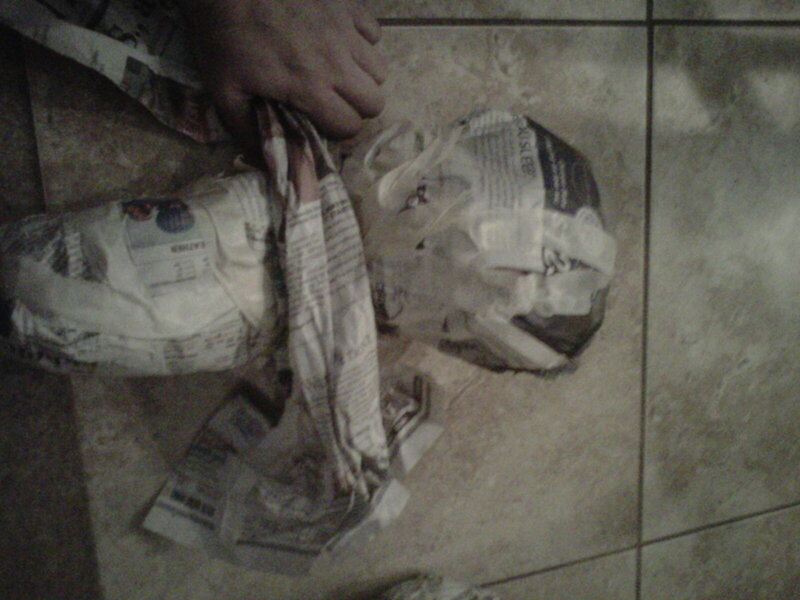 Also since it's so small i would use phonebook paper instead of newspaper for roots and branches. 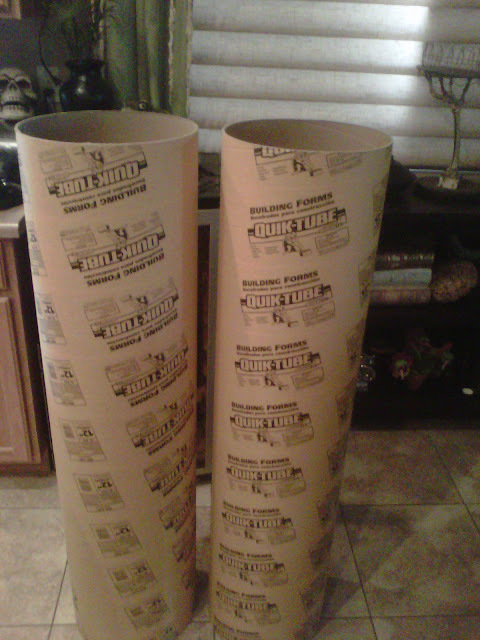 I love phonebook paper for building up on smaller scale things because it's so smashy. Great question. 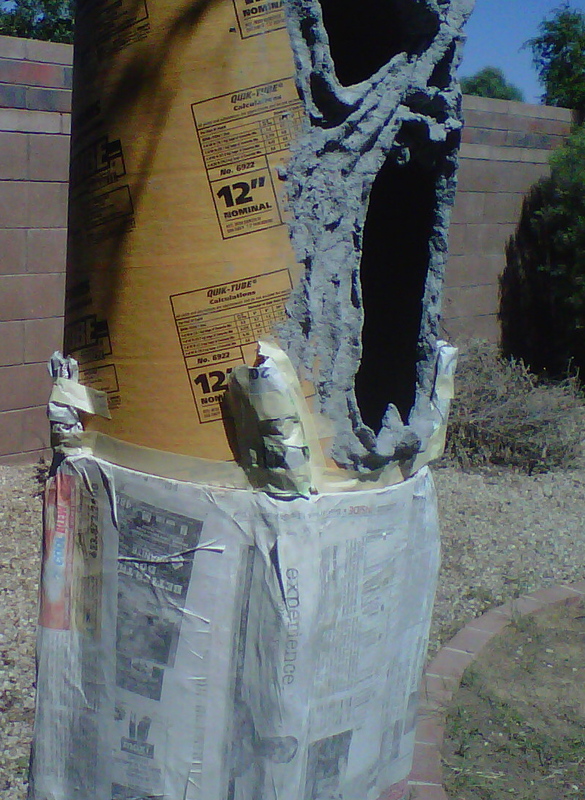 If I was going to do this outside I would use several coats of Drilok masonry sealant before I painted it. I have used that on all my papaer mache products that go outside (like my gravedigger) and they hold up amazing. You would also need to cover the top so water doesn't get inside. 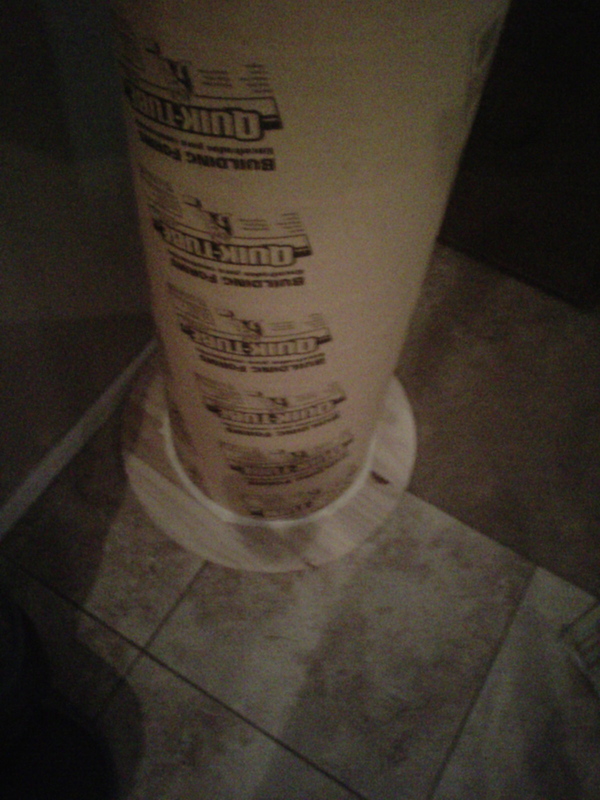 Just a piece of cardboard cut and covered like everything else should do that. oh my you are awesome! love it! OMG! Amazing! Congrats your blog is fantastic! I saw this and I had to try it. I've just tonight finished the celluclay face. Wonderful tutorial! Did you get any photos of it with the vegetable life hanging from the branches? I was wondering if you use any particular recipe for your papier-mâché? Hi Shawn! I forgot to get the pics with the foliage on. I kind of liked it better without though. My paper mache recipe is pretty simple flour and water and sometimes a little liquid starch. No precise measurements either. I just mix the flour and water until it's soupy and not too lumpy. 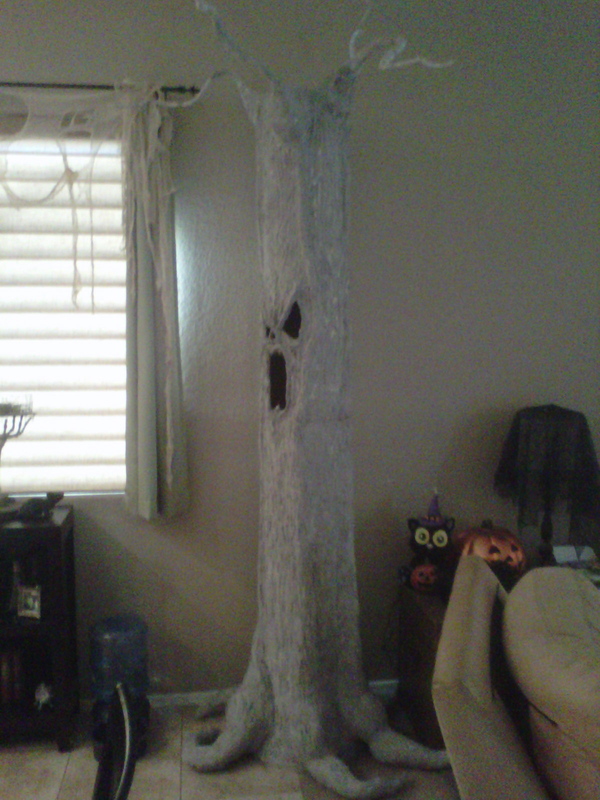 I just came across your Haunted Tree and thought it was awesome! I I'm an intern at Instructables.com, the largest project-sharing site with well over 75k projects all submitted by our users, and I just know our community would love to see your projects. 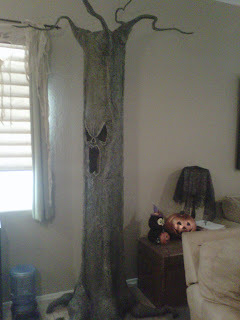 I wanted to give you a shout out and let you know about our Halloween Decorations Contest that is going on right now! We're giving away some great prizes including an iPad 2 and Panasonic Lumix SZ7 14.1 MP Digital Camera. Also, 2 grand prize winners from all of our Halloween contests will get a choice of a MacBook Pro or Laser Cutter! Please let me know if you decide to post your project, I would be happy to feature it on our site and help get it noticed among our over 13 million visitors. Thanks Shelly! I love Instuctables.com! Who cares about a clean house?!? You are a creative genius and shouldn't be bothered with such mundane things as laundry! Love it! Of course you can use it. Thank you for the feature. I usually come on and admire the creativity of other's and have never felt the need to actually compliment someone until now The Hard work and amount of thinking that went into this project is quite incredible not to mention Your DIY diligence and get it done attitude are exemplary.....In The End What You have Created is nothing short of FanFreakenTastic!....Bravo!!! Beautiful work! I'm sending you a link to a fabulous lady's blog--she's got recipes for making your own clay posted along with tons of ideas and photos and how-to videos. She's got quite a following, me included. I think you'll get tremendous ideas from her and you can share your ideas too. Amazingly talented people post their projects and then explain how to create them too. And I think you'll save a TON of money by making your own mixtures. Here's the link: http://ultimatepapermache.com/ I'm so grateful I stumbled onto her site! I hope you enjoy her site as much as I do! I hope this information gets to you...I've never commented before. This is amazing! You are very talented. I hope you do something like this for a living! Absolutely Awesome.....what else can be said. You are awesome! I'm using some of your ideas for my daughter's school Halloween dance. Love the way your mind works!! Most creative Halloween project I've seen in a long long time. It's wonderful--can't wait to try it. How did u get your roots to stay attached, with paper mache? 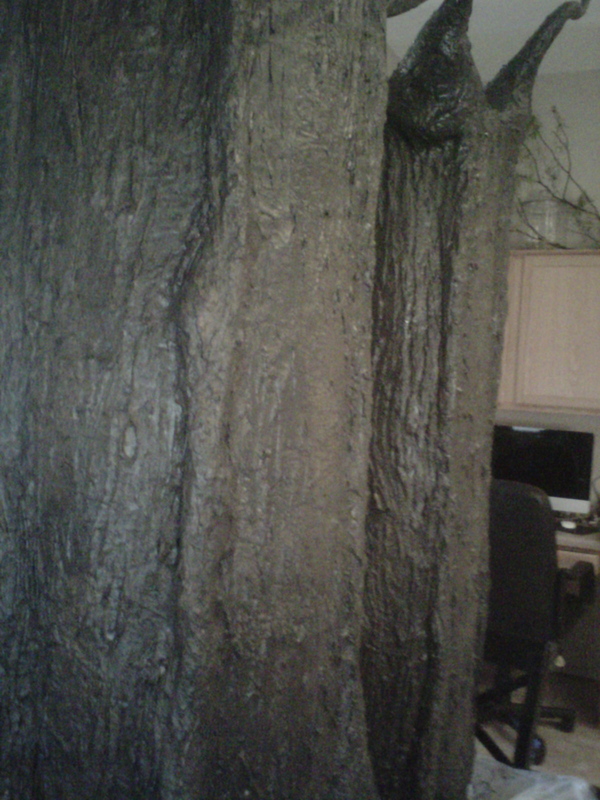 I'm afraid once everything drys and I go to move it, the roots will be too heavy and detach. Please explain. Thanks in advance! The roots were attached to her base with tape. The paper mache' was the final step before drying. 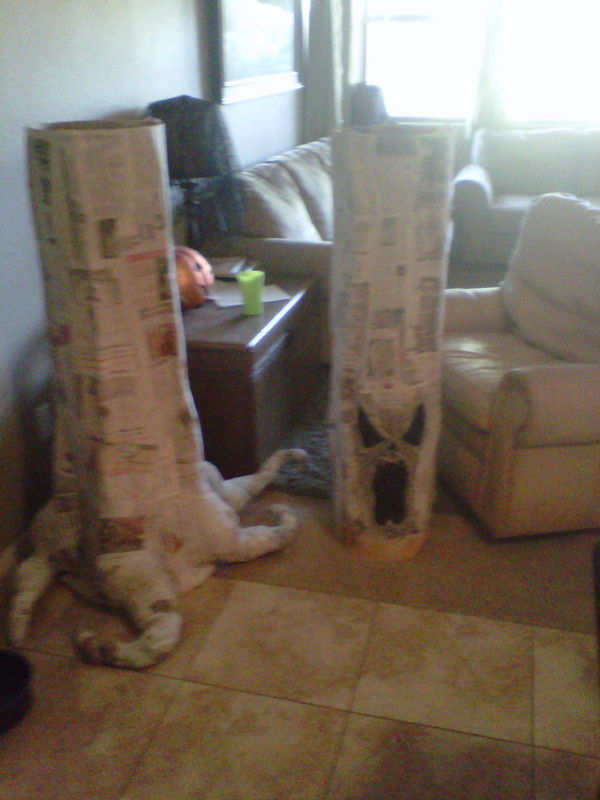 The roots were only make out of crumbled newspaper so I can't imagine them being too heavy as long as the paper mache' was mixed correctly. Make sure to let it cure for several days. How big of a bag did you need for this? Are we talking the 5 lb bag or the 24 lb bag? 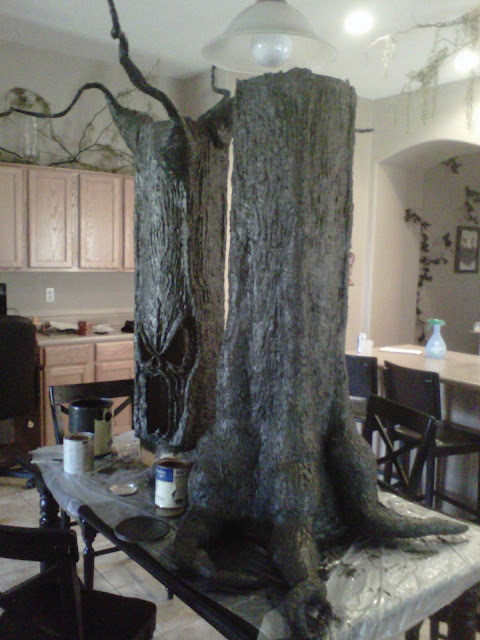 HI am making a few of these trees for a haunted house project. Not sure how much celluclay was used on your tree? Do you know how many cans of spray paint you used? ok I thought I was going to be the only one in 2018 posting a reply. It blows my mind that I can jump into a conversation that started in 2011. Anyway I'm going to attempt to do this. If it looks good I'm doing 50 for next years halloween.